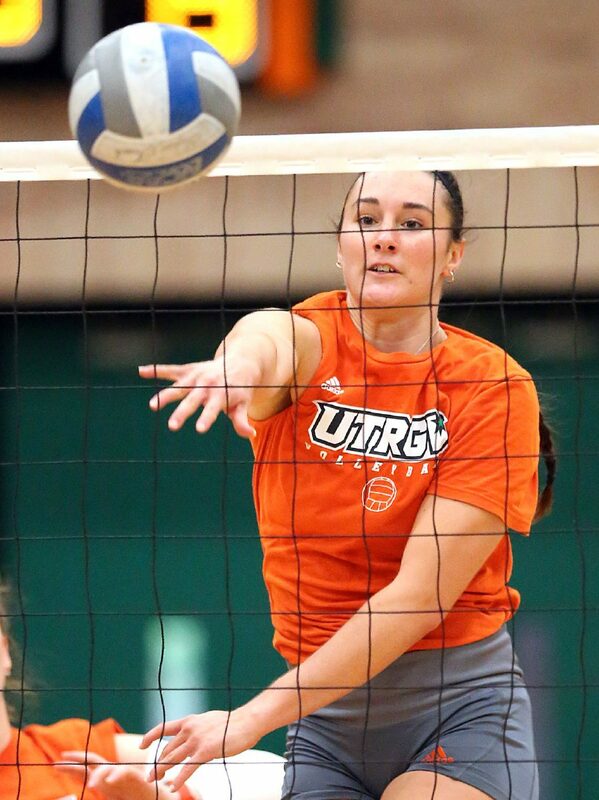 Draik Banks at volleyball practice at the University of Texas-Rio Grande Valley on Monday, Sept. 10, 2018, in Edinburg. EDINBURG — When Baylor sophomore Taylor Marburger stepped to the line to serve during Saturday’s match against UTRGV, Vaqueros junior Draik Banks knew what to expect. The two were teammates at McAllen Memorial during Banks’ senior year in 2015, when most of her 226 kills were set up by assists from Marburger. The Mustangs went 35-8 that season, losing a five-set match to San Antonio O’Connor in the fourth round of the playoffs. Serving was one of Memorial’s many strengths, as Marburger smashed a team-leading 58 aces with her hard float serve. The former teammates only had fleeting moments to catch up on Saturday, Banks said. At the end of five grueling sets, UTRGV had knocked off then No. 15-ranked Baylor 25-14, 26-24, 16-25, 20-25, 15-10, marking the highest-ranked opponent UTRGV is believed to have ever beaten. The match stands as an early season highlight for Banks, who is making a Valley homecoming this year after spending her first two collegiate seasons at Niagara. Banks finished the match with two kills and two block assists — modest totals relative to the numbers she’s posted this year. So far this season, the 6-foot-1 middle blocker has started eight of 10 matches for UTRGV, averaging 1.15 kills and 0.62 blocks per set. As a freshman at Niagara in 2016, Banks averaged 0.72 kills and 0.55 blocks per set, appearing in 64 of the team’s 120 sets. She took a significant step forward as a sophomore, appearing in all but one set and averaging 1.71 kills on a team-best .301 hitting with a team-high 0.99 blocks per set. Niagara as a team also showed progress, improving from 12-19 overall and 10-8 in the Metro Atlantic Athletic Conference in 2016 to 18-10 overall and 14-4 in conference in 2017. Then, Niagara head coach Vilis Ozols left the school in the spring to take the same position at Siena, and Banks started to consider a transfer. She was familiar with UTRGV coach Todd Lowery from her time on the RGV Venom travel team, so she said she never considered any other schools. Joining an experienced roster and playing tougher competition were both positives, and Banks said she also relished the opportunity to be closer to home. Her younger sister, Demy, is a junior playing middle blocker for McAllen Memorial, and her mom “makes some pretty good arroz con pollo,” Banks said. 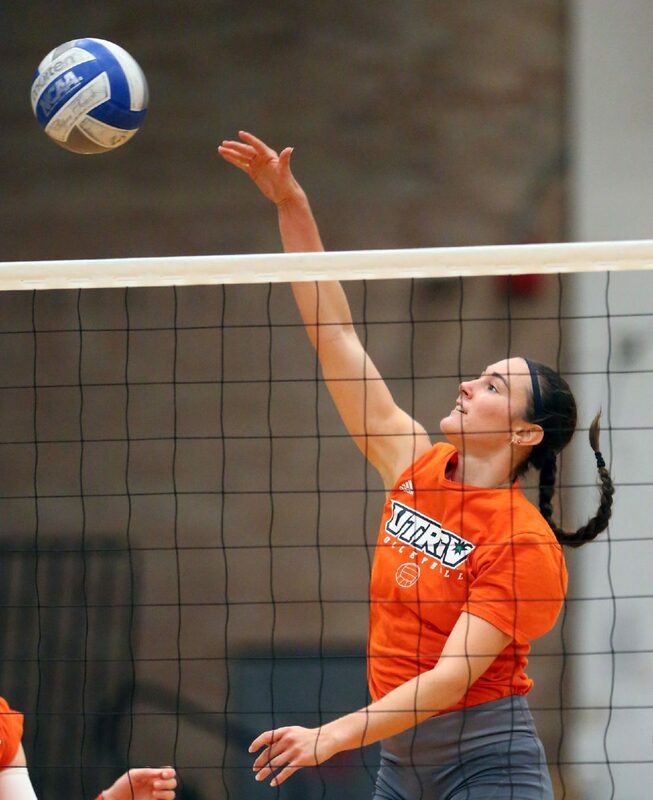 At UTRGV, Banks can regularly play in front of friends and family, which was nearly impossible when she was almost 2,000 miles away at Niagara in Lewiston, New York. Lowery said Banks has exuded many of those same qualities this season. On Monday, Banks was on the court working on her blocking for more than 40 minutes after most of the team had cleared out for the end of practice. Lowery described Banks as “fiercely competitive,” saying she welcomed the heightened level of competition UTRGV faces relative to Niagara. 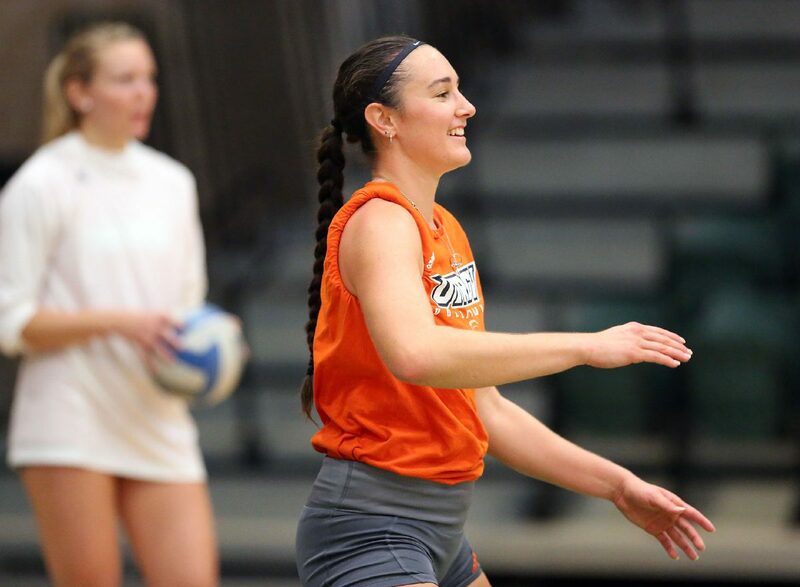 Helping her adjust to playing with a new group of setters in a faster system has been a challenge, Lowery said, but one that Banks has faced head-on.